This was meant to go out earlier – but life intervened. We’ve been quiet here for most of the month and hope that you managed to ace the NaNoWriMo and the NaBloPoMo in November. But hey, you know what they say – take a step back to surge forward! On that note, we have some great announcements! 1. We’re reintroducing the Write Tribe Pro Blogger Challenge with immediate effect. You know how that works, don’t you? You write every day on your blog and add your link to the linky to the weekly post here, which will be up every Monday. Now’s the time to buddy up with your blogger friends and ask them to join in too! The more, the merrier! While it is great for us to be giving every day, #GivingTuesday helps us focus on the value of giving. Today we encourage you to look at some ideas for giving and try them out in your homes, workplace, and wherever you can, through the week. Then share your experience with us in a post and add your link to the #GivingTuesday Blog Hop post that will be up here next Tuesday. Home Treasure Hunt! Look in your closets at home …kitchen tools, dishes, towels and sheets, toys, books, school supplies. Collect what is not being used, what hasn’t been used in a long time. Collect the extras you have, and donate them – to a family in need or an organization that helps people who are setting up new homes. Organize a blood drive, clothing or book drive, or another giving activity in your neighborhood, at your workplace, on your campus. Remember that no act of kindness however small, is ever wasted! We invite the participants of the Gratitude Circle to join us on Facebook and Google Plus. And….we’re ready to roll again! 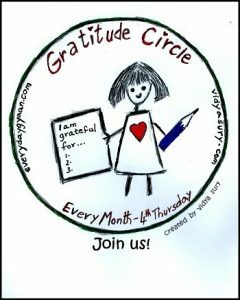 Looking forward to getting back into our Write Tribe Pro Blogger groove, enhanced by #GivingTuesdays and Gratitude Circle! Go on. Spread the word! And have a wonderful week!